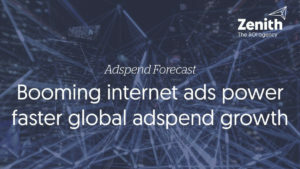 Stronger-than-expected internet advertising will drive 4.7% growth in total global adspend in 2019, according to Zenith’s Advertising Expenditure Forecasts, published on March 25. That’s substantially ahead of the 4.0% forecast made in the previous edition of the report, published in December 2018. Zenith forecasts 4.6% growth in both 2020 and 2021, ahead of previous forecasts of 4.2% and 4.1% growth respectively. Zenith has upgraded their forecasts after internet adspend markedly exceeded their expectations in 2018. They currently estimate that internet advertising grew 16% last year, up from their previous forecast of 12%. In dollar terms, they have upped their estimate of the internet adspend total in 2018 from US$231bn to US$246bn. This leads them to expect faster growth for the next few years – an average of 10% growth a year to 2021, up from their previous forecast of 9%. They now expect internet advertising to reach US$329bn in 2021, and account for 49% of all global adspend, up from their 47% forecast in December. This growth is being driven by the overlapping channels of online video and social media, which they expect to grow by 19% and 14% a year to 2021 respectively. They forecast display advertising as a whole – which encompasses video and social, as well as banners – to grow by 13% a year, while paid search and classified lag behind, growing at an average of 7% a year each. Zenith has made the biggest increases in their internet forecasts in the US, Russia and France. They have increased their overall growth forecasts for 2019 from 2.9% to 5.0% in the US, from 7.1% to 8.2% in Russia, and from 3.7% to 4.7% in France. The US accounts for 37% of all global adspend, so any upgrade here has a great effect on the global total. They expect the US to be by far the largest contributor to global adspend growth between 2018 and 2021, adding US$32bn to the market. China will be in second place, adding US$16bn, and India in third, adding US$5bn. A large proportion of the growth in internet advertising – and therefore the ad market as a whole – is currently coming from small businesses, such as local shops, restaurants, and hobby stores. Platforms like Google and Facebook have opened the ad market up to many small businesses for the first time, by offering simple self-serve tools to create ads and manage campaigns, and provide the localisation and targeting they need to reach their limited potential customer base, converting customers effectively. Small business advertising is rising from a very low base, towards a share of the ad market that better reflects their contribution to the economy: in most countries small businesses contribute half or more of GDP and a larger share of employment. These businesses don’t need to use mass media to create wide awareness – indeed, their customer base is often so limited, by geography or special interest, that using mass media would be too wasteful. Meanwhile digital challengers to established brands are using technology to shake up every category, using venture capital – new money to the ad market – to fund digital-focused awareness campaigns. These brands are, or are aiming to be, large enough that they need scaled exposure to win new customers and build market share. Doing this online requires a quite different strategy to building awareness through traditional media. Social video combines wide reach, precise targeting and high-impact creative, but attention spans are notoriously short, with the average swipe through a news feed taking just a couple of seconds. Brands need to create awareness through repeated short exposures, and use personalisation to make ads more relevant to viewers to grab and hold their attention. Challenger brands do not rely on digital advertising alone, and are establishing themselves as prominent advertisers in offline media, particularly television and out-of-home. Spending by these digital-native brands is helping to prop up global television adspend, which is roughly stable despite rapid declines in traditional television viewing in key markets like the US and China. Zenith’s forecast is that television advertising will grow by 0.7% a year to 2021. Note that this includes only traditional, linear television; television-like services delivered over the internet are included in Zenith’s internet adspend totals. Out-of-home advertising is the fastest-growing ‘traditional’ medium in dollar terms – Zenith expects it to grow by US$4.4bn between 2018 and 2021, ahead of television’s US$3.7bn. Out-of-home is still benefiting from the spread of digital screens, but also from the emergence of programmatic trading, allowing agencies to make more efficient and effective data-enabled transactions. Print advertising continues to decline. Zenith forecasts magazine adspend to shrink by US$5.0bn between 2018 and 2021, and newspaper adspend to shrink by US$6.3bn, with no end to either decline in sight. Between 2013 and 2018 their combined share of global adspend fell from 24% to 13%, and expect this share to fall further to 9% by 2021. Again, these figures only include advertising in printed publications – any advertising on publishers’ websites or other online brand extensions is included in the internet advertising total.